I love that at each of the boys well baby check ups they get a new book thanks to the Dept of Education. At Owen's 3 year check-up the doctor brought in 3 books and let Owen choose. He chose this book called Click Clack Moo, Cows That Type. It was a really cute book. After Owen got put to bed early the other night Jack decided that he should have some fun "reading" Bubba's book. I love his expressions! Hey look....my eyes do open! Since Ella has gotten most of the bilirubin out of her system we've noticed that she is having more and more awake time. It's been fun talking to her and seeing her be happy and content. I hate when my boys are sick...especially when there's not much I can do for them. Tylenol helps, but mainly he just has to get over it. Of course what accompanies him being sick is...a lack of appetite, restless nights and a super bad attitude. In fact today he "woke up" from his nap and was in such a sour mood he ended up being put to bed for the night at 5:30pm....that's a record! I think and hope it's what he needs to start feeling better because this is getting old real fast and I want my sweet, happy, healthy little boy back. When Ella sleeps...she sleeps. You can move her all over the place and she won't wake up. She might readjust herself and stretch, but then it's right back to sleeping. All these pictures were taken during one sleep session starting out on Daddy's legs and ending on Mama's chest. Love that cute chubby face! I finally captured a smile on camera...don't pay attention to the creepy eye. Ella's been smiling and laughing in her sleep for a couple days now. It's so cute! She is just so scrumptious! Is there anything more cute? Then he said, "All done!" and shoved her off him....needless to say I didn't get a picture since I was trying to catch Ella. I am so in love with my baby girl. I love her...I love her...I love her! At the same time I can't say I ever necessarily wanted or saw myself as a Mama to a baby girl. In fact when I first found out I was pregnant I actually wanted it to be a boy and I really was against having a girl. Of course God changed my heart during the beginning of my pregnancy and by the time we found out we were in fact having a girl I was over the moon excited! With that being said...it really...I'm not sure if hurts or bothers is the right word...maybe frustrates me as a mother of two boys and then a girl that people assume that we were trying for a girl since we had two boys. Or that we are now done having kids because we finally have our girl. That's so not true! Michael and I would have been over the moon excited had it turned out we were having another boy. We weren't trying for anything other than a baby! In fact we weren't trying at all. God blessed us with this beautiful baby and we feel so lucky to have her and our two beautiful boys. On Monday night I decided it was time to give Ella a bath. She has so much more hair than the boys ever had and everyone loves to rub her head so it was getting a bit greasy. Time to get undressed...don't you hate it when the camera strap falls in the picture!!! The boys were like....What is going on here? Can you help Mama wash Ella? Time to scrub that greasy hair. Ella is such a sleepy girl it's hard to get her to wake up to nurse. So the other day I decided to give her some tummy time in hopes that it would make her mad and wake her up. Ella has really surprised us with how different she is in regards to sleeping. Both the boys were horrible about scratching their faces. We had to swaddle them almost all the time in order to keep them from clawing at their face. Ella sleeps almost all the time unswaddled...of course she's wrapped in a blanket, but not tightly. I do swaddle her at night just because I'm afraid she's going to get too cold. Ella Grace - 3 days old! Ella is adjusting to the outside world so well. She is a super sleeper. She has pretty much put herself on a 3 - 4 hour feeding schedule. At times I still have to wake her so she'll eat. My milk has come in now so she's getting fuller than she was before. She's also spitting up a little now, but that's because she prefers to burp when Daddy burps her. She barely cries at all and when she's does it's a really soft cry. We took her to the doctor yesterday for her first check up. She did lose some weight while we were in the hospital...she went down from her birth weight of 8lbs 10.1oz to 7lbs 14.5oz. Yesterday at her check up she had already started to go back up and her weight was 7lbs 15.5oz. The doctor was a little concerned because by her color...he thought she might be a little jaundiced so we went down to the lab and they took her blood and did a test. The doctor called us back and she's just fine so she doesn't need to go in for light therapy. Next week we do need to take her back to the doctor for a weight check to make sure she's still gaining. We are enjoying our sweet newborn girl and adjusting to a new normal at home. Both Ella and I were discharged from the hospital on Thursday February 18th. We strapped Ella into her new car seat for the first time. Thankfully she didn't seem to mind being strapped in. I love the newborn insert that came with the car seat. It made it to her head didn't flop from side to side. I remembered saying something about Michael's new car a while ago, but then I didn't do another blog with a picture. Here is it...it's a 2007 or 2005 (I can't recall right now) Hyundai Sonata. It's been a nice car for Michael. Ella did great on the way home. We even heard her snoring. She's only been in the car twice so far and she did great both times. A few weeks ago my mom and I took the boys shopping. We pulled into the Target parking lot and started searching for a handicap spot. My mom has had both her knees replaced so she has one of those handicap placards you hang on your rear view mirror. Right when we were going to turn down a row where we saw a free spot a Dodge Caliber pulled down the row first and got the spot. He didn't cut us off or anything so I wasn't mad. My mom can be a little vocal about things like that so she said something like, "Oh you pig!" We got the boys out of the car and went shopping for quite a while. On the way out Mom and I were just chatting away when we were interrupted by Owen saying, "Hi pig!" as we passed the very same Dodge Caliber in the parking lot on the way to the car. Mom and I just busted up laughing because first we couldn't believe that Owen remembered the car and second he didn't say it in a mean way at all...I think he really thought that the name of that car was pig! A few days ago I visited my friend Jen and I was telling her all about my recent meltdown. Owen was sitting next to me in a chair drinking and I said something like, "Sometimes the boys can drive me so crazy!" That's when Owen looked up at us and said, "I drive Mommy nuts!" It made both of us laugh. Later on that day I told Michael about that story and he said he's going to teach Owen to say, "I can't drive you somewhere you've never left" if he hears me say that again. Thanks hon!!! We've started disciplining Jack for misbehaving by putting him in time-out. We've been at this for a few weeks and he's doing great. He never gets out of time-out on his own, he waits until his time is up. We follow the rules that Super Nanny uses. Most of the time Jack gets himself put in time-out for either hitting me or Owen. He's still trying to figure out how to express his emotions in the correct way. Anyways...once his time-out is done I talk to him about why he was put there in the first place and then he has to go tell whoever he hit that he's sorry. Almost every time I get to this part Owen comes out of nowhere and says, "Sorry Jack I no hit!" He's so cute wanting to take the fall for his brother. We've tried explaining that he didn't do anything wrong, but I think it's a little confusing for him. Jack does eventually say he's sorry though. It seemed like we were sick pretty much for the first month and a half of 2010. During that time I was clearing my throat a lot. Owen was wondering what I was doing so I told him I just had a frog in my throat. Now whenever he coughs for clears his throat he looks at me and says, "I just have a frog!" They may not be in their bathing suits, but they sure are cute!!! As promised here are some pictures from my two baby showers back in January. The first shower was thrown by my friend Ellen and was held at my Mom and Dad's house. My Grandma in Denver made this cute bootie for a decoration for the party. 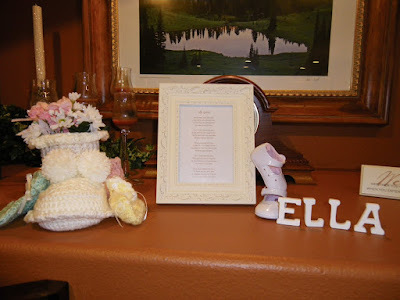 I also brought Ella's poem that I framed for her room, the letters that Starr bought for the professional pics that she did and Ella's little white shoes. Here's the spread....we had strawberries, cheese and crackers and the best cucumber sandwiches I've ever had. The cupcakes were super yummy too!! 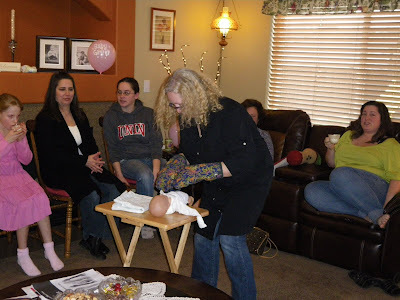 One of the games we played was diapering, dressing and swaddling a baby with oven mitts on in the least amount of time. 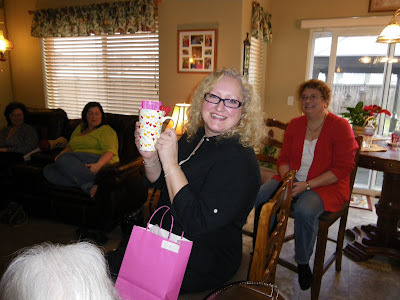 My SIL Michelle won and her prize was perfect for her...a coffee cup! 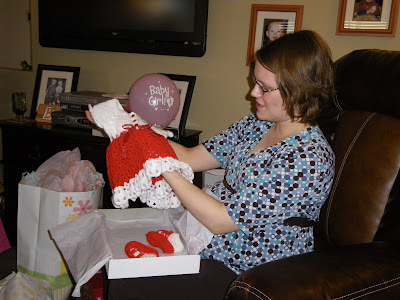 Here I am opening the dress my Grandma made for Ella. While I was opening presents Jack woke up from his nap and Aunt Becky held him and wrote down who got me what....what a terrific Auntie! Carolyn, Erin and SIL Becky and niece Samantha. Katie, Jen, Jen's son Joe and Zirah. For some reason we didn't take any pictures of us playing the games or me opening presents. I guess when it's the 7th time you've had a baby shower taking pictures isn't a high priority. I had so much fun being with family and friends to celebrating the upcoming arrival of my baby girl. Thanks for making it wonderful ladies!!! We've had lots of visitors the last two days. Of course the first two visitors were Ella's big brothers!!! Ga-Ga and Pa brought Owen and Jack to the hospital on Tuesday morning. Daddy went out in the hallway to bring the boys in so we could have some family time, much like we did when Jack was born. We thought Owen would be more excited since he's experienced this whole thing before, but he really didn't care one way or another. I'm sure he'll be more receptive to Ella once we're home though. Now Jack I was worried about...he is such a Mama's boy so I was sure he would be very jealous. He has really surprised us though. He wants to hug, kiss and snuggle Ella all the time. He just loves her so much. Ga-Ga and Pa brought the boys to the hospital the last two days. It's been nice to see them, but I miss being with my boys all the time. I'm so happy we are heading home tomorrow afternoon. Pa got some extra time with Ella today because he came back this evening with Uncle Ryan. It was so nice visiting with Uncle Ry and he loves that Ella has the same chubby cheeks that I had when I was a baby. Last night Aunt Becky, Uncle Jon, Camryn and Samantha came to meet Ella. Later on yesterday evening Papa & Grandma Martin came to meet Ella as well. Our Pastor even dropped by to hold Ella and pray over her. She was a little hungry during this time so that's why she doesn't look too thrilled. Uncle Rick, Aunt Michelle, Avery, Cooper and Paige all came to meet Ella this afternoon...Aunt Michelle could barely let Ella go. Ella sure is a popular baby girl. I know we'll be having a lots of visitors in the next few days and weeks. We love sharing our girl with friends and family. Can It Really Be February Already?